One of my favorite websites is called The Oatmeal. Featuring entertaining comics and blogposts, creator Matthew Inman succeeds in making his point clear with every post. Topics range from cats to grammar to technology issues, all presented in a hilarious manner. 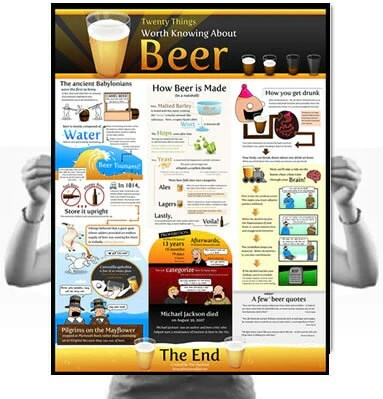 This graphic is informative on the production of beer while providing humorous quotes from an array of figures. His illustration style is lighthearted and consistent, and I continue to check back often for new pieces. Many of them are especially relevant to designers, and I seriously embarrassed myself laughing about the “8 Websites You Should Stop Making” comic. Enjoy! Previous Previous post: fed ex.